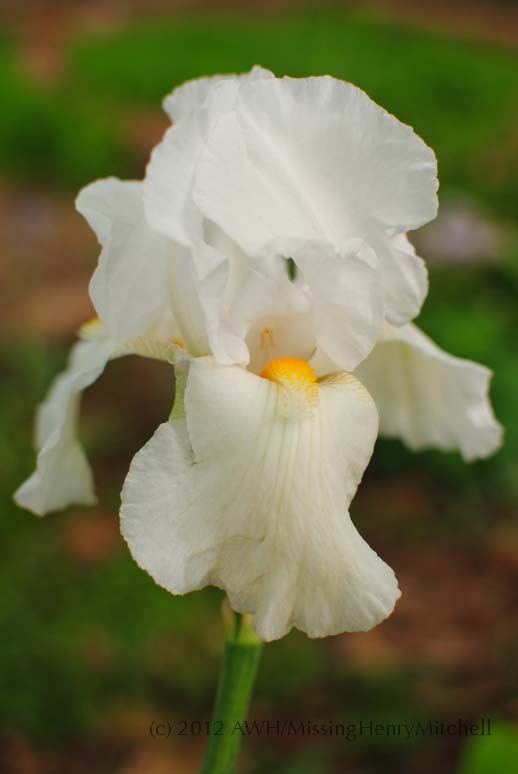 When we bought the property where we now live, we inherited perhaps five hundred bearded iris, most of them with rhizomes about three quarters of an inch long, and none of which bloomed. Everything I read said how easy bearded iris were to grow. It is true that it doesn’t take much to make them grow. They will grow in any utterly neglected condition, as was the case with our property (it had belonged to a widow who was in poor health and liked the “natural look.”). They were limping along, dignity barely intact, in our dense, highly acid clay soil. In deep shade. To make them grow well, and bloom profusely, requires slightly more attention. It is important, first of all, to make sure the rhizomes are healthy. Mine had apparently gone through a cafeteria service of iris disease problems, acquiring helpings of iris borer, bacterial and fungal leaf spot, and bacterial soft rot, which had left the foliage unsightly and all but a smidge of rhizome gnawed, rotten, and mangled. So the first step (after, of course, obtaining a soil test to determine the pH and nutrient analysis of the soil) was to dig them all up and cut off the diseased parts of the rhizomes. It is important to disinfect one’s tools during the process, or risk transmitting any virus or bacterial infection to the healthy rhizome. I played iris surgeon for a day and removed and threw away (do not compost!) the damaged bits, disinfecting the entire rhizome at the end of it all. I dipped both my tools and the post-surgery rhizomes in a solution of 1:10 bleach:water. I also trimmed back the healthy foliage to about 6″ in length (unhealthy foliage goes into the garbage). The next step is to replant them appropriately. Bearded iris like to bake their rhizomes in the sun. 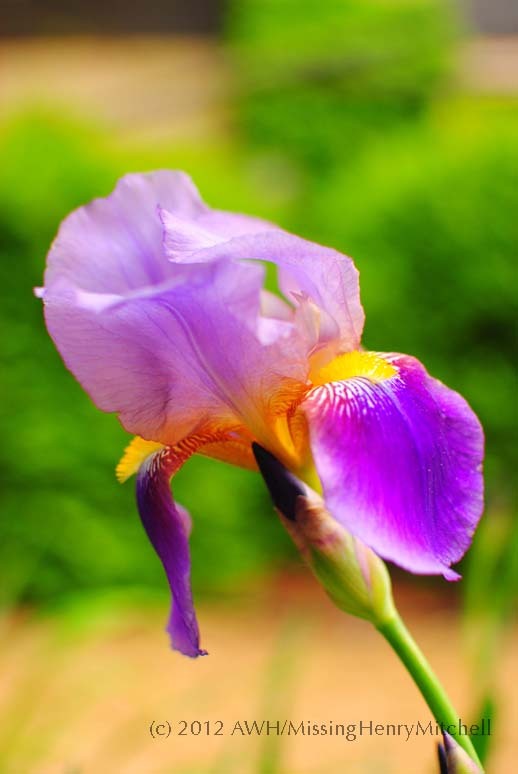 This preference can make things difficult when the iris are planted in a mixed border that wants mulching. The key is to mound up little hills for the rhizomes to sit upon. Then, spread the roots around the hill, similar to the practice of planting a bare-root rose. Cover up the roots but leave the rhizomes uncovered. Mulch around the rhizomes but not on top. Rain invariably washes my mulch, which is typically finely shredded leaves from the oak trees on my property, over the rhizomes, so when I’m doing my rounds pulling weeds or inspecting the troops, I try to remember to brush the mulch off any covered-up rhizomes. It has taken about two years for the patients to recover, but I think the rehab is complete. What do you think?